Hamza Syed braced for an anti-Muslim backlash that never happened. Sept. 11, 2001, ruptured 13-year-old Hamza Syed’s world. Being Muslim instantly became the only part of his identity that seemed to matter; kids at his school in Lynn besieged him with questions he could not answer. He had immigrated to the United States from Pakistan at age 3, but he no longer felt allowed to call himself American. A year ago, after the Boston Marathon bombings, Syed braced himself for another anti-Muslim backlash. It never happened. 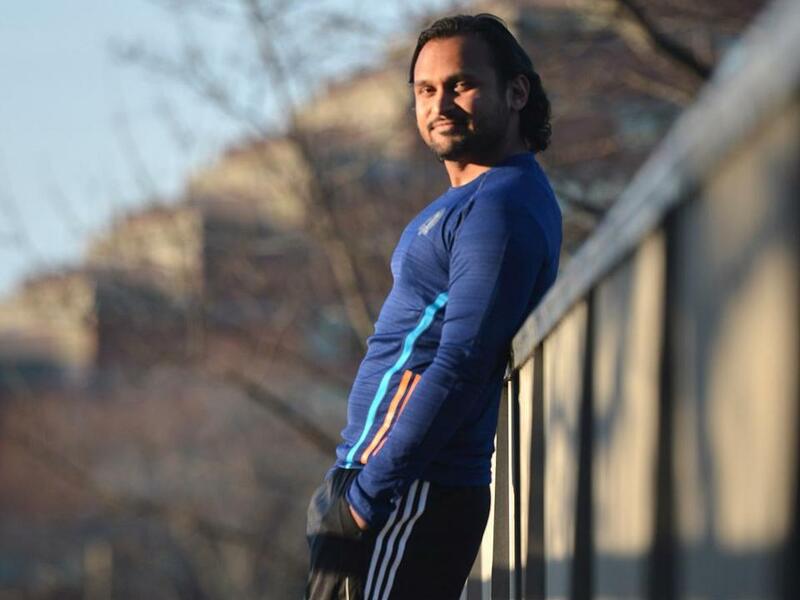 On Monday, Syed expects to run the Boston Marathon for the first time, an act he sees as an expression of his love for his resilient city and for its embrace of diversity. To be sure, there were isolated displays of Islamophobia in the aftermath of the Marathon bombings. A woman wearing a hijab was assaulted on a street in Malden. Strangers sent hateful e-mails to Boston’s mosques. Some Muslims feared being questioned by law enforcement or seethed over a tabloid’s portrayal of two innocent Massachusetts men as possibly connected to the bombings. But the broader tableau showed a city that has become more welcoming of Muslims in the years since the 2001 attacks, many local Muslims said. The scale of the two tragedies was very different, but many Muslims said improved interfaith cooperation and increasingly diverse schools and workplaces contributed to a change in tone. It also seemed, they said, that their non-Muslim neighbors had grown more knowledgeable and less fearful in a dozen years of discussing terrorism, war, national security, and religious liberty in the public square. “Now, when an act of terror occurs, people can see it for what it is: someone exploiting religion, someone with serious issues,” said Jalon Fowler, a 38-year-old Muslim who ran in last year’s Marathon and will compete again this year. After the Marathon bombings, many Muslims said they felt reassured by gestures of support and concern from friends and coworkers, from local politicians and clergy of other faiths. Bostonians, they said, seemed to understand that most Muslims were as horrified at the violence on Boylston Street as everyone else was. “There is never a silver lining to mass murder, or attempted mass murder,” said Imam William Suhaib Webb, spiritual leader of the Islamic Society of Boston Cultural Center in Roxbury, the city’s largest mosque. “But what we learned is, this is a really great city with incredibly sincere people. Greater Boston’s two most prominent mosques were inundated with press calls and television cameras after the bombings, especially the Islamic Society of Boston in Cambridge, where suspects Tamerlan and Dzhokhar Tsarnaev occasionally worshipped. Ismail Fenni, acting imam of the Cambridge mosque, tried to field reporters’ questions and to respond to the stunned congregation, few of whom had known the Tsarnaevs. “We were worried the name and the reputation of the mosque would be stained,” Fenni said in a recent interview. “What we learned is, this is a really great city with incredibly sincere people,” said Imam William Suhaib Webb, of the Islamic Society of Boston Cultural Center. Those fears eased as neighbors lent support in calls and e-mails. A couple of weeks after the tragedy, the mayor of Cambridge and other officials led a peace walk from City Hall to the mosque. The Roxbury mosque was also caught up in a media barrage that turned ugly when USA Today and Fox News suggested the mosque was cultivating extremism. But, here too, the community offered a balm: Neighbors sent notes. Felix G. Arroyo, then councilor at large, spoke at the mosque’s vigil for bombing victims. Messages of support from Jewish and Christian clergy poured in. A series of important moments in interfaith relations in Boston followed. The Friday after the manhunt in Watertown, Rabbis Ronne Friedman and Jeremy S. Morrison of Temple Israel and the Rev. Burns Stanfield, president of the Greater Boston Interfaith Organization, offered prayers and words of solidarity at the Roxbury mosque’s midday prayer service. In January, Webb made history by preaching at Temple Israel’s annual Shabbat service honoring the Rev. Martin Luther King Jr., becoming the first imam to formally address the city’s largest synagogue. Nearly 1,000 Jews, Christians, and Muslims lingered long afterward to eat, chat, and even join in a little traditional Israeli dancing. Nancy Khalil, a doctoral candidate in social anthropology at Harvard and a former Islamic Cultural Center leader, marveled at the warmth. Years ago, in the same place, she remembered “trying to explain who we really are, in these really anxious, tense meetings” with Jewish leaders, who were then trying to reconcile their desire for better interfaith relations with their communities’ concerns about a mosque founder’s anti-Semitic statements and alleged extremist ties. On the evening of the bombing anniversary, Webb was a featured speaker at a gathering for “Remembrance and Hope” at Old South Church. The Rev. Nancy S. Taylor, Old South’s senior minister, personally invited Webb’s congregation to the service. She spoke at the end of last week’s Friday prayers at the Roxbury mosque, becoming the first woman to ever speak in that forum. Boston’s clergy have been working to build better interfaith networks since the September 2001 attacks, through formal channels like the Greater Boston Interfaith Organization, and informal ones, like a get-to-know-you group of Jewish, Christian, and Muslim leaders that began meeting months before the bombings. The mosques and local law enforcement leaders have also nurtured a working relationship. After the bombings, said Yusufi Vali, executive director of the Islamic Society of Boston Cultural Center, leaders of the Cambridge mosque contacted the FBI to share information about Tamerlan Tsarnaev’s two outbursts at Friday services. As the investigation proceeded, Muslim leaders worked with civil rights lawyers to set up a hotline for Muslims seeking legal counsel. Part of the challenge in fostering cooperation with law enforcement lies in helping Muslims feel safe after years of distrust stoked by no-fly lists, the New York Police Department’s mosque infiltration program, and the FBI’s shooting of Ibragim Todashev, a friend of Tamerlan Tsarnaev. 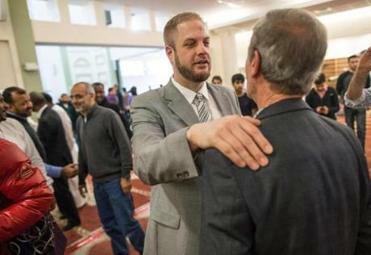 Over the last year, the Roxbury mosque has held two forums to help Muslims understand their civil rights. Vincent B. Lisi, the special agent in charge of the FBI’s Boston division, visited the mosque last month to introduce himself and answer questions. Speaking to about 75 people gathered in the mosque’s café, Lisi exuded friendliness and spoke engagingly about his service for the agency in Yemen. But the questions anonymously submitted to the moderator on slips of paper — about racial profiling, entrapment, and mosque infiltration, among other topics — revealed deep anxieties among those gathered. Laila Murad, a 23-year-old Muslim student and civil rights activist who grew up in Framingham, said many local Muslims feel targeted, vulnerable. The first responders to the bombings included many Muslim doctors and other health professionals. Among them was Dr. Firas Naji, a hospitalist at the Cambridge Health Alliance, who was volunteering at Medical Tent B, a couple of blocks from the finish line. Naji, who sees his vocation as an answer to Islam’s call to alleviate suffering, treated a few shrapnel wounds, but mostly took care of runners with hypothermia, low sodium levels, and foot problems, as well as severe emotional distress. Shamaila Khan, a psychologist who is clinical director for the Disaster Behavioral Health Program at the Center for Multicultural Mental Health at Boston Medical Center, helped counsel families of the grievously injured. Khan felt herself involuntarily loosen her grip on the woman’s hand. Consciously, she tightened it again, quickly setting the comment aside so she could continue taking care of the suffering woman. That moment stayed with Khan in the days and weeks that followed, as she helped tend to Muslims affected by the tragedy. She is now working with a team of professionals on providing Muslims with better access to mental health care. She also recalled a neighbor stopping her a few days after the bombings to ask, simply, “Are you OK?” A small gesture, but powerful in its way. Last year, Jalon Fowler was running the race for the third time, on track to finish with her best time ever, when a police officer stopped her just after Heartbreak Hill. The race was over. A couple of days later, she sent her husband to pick up her medal downtown. She did not want to deal with any sideways looks from strangers as she passed by in her headscarf. Yet Fowler, who converted to Islam in 1999, felt none of the fear she felt after the 9/11 attacks. Her colleagues and training teammates at John Hancock, a primary sponsor of the Marathon, were as friendly and supportive as ever. She knew, within a couple of days, that she would run again this year. Marathoner Jalon Fowler said much has changed in America. “Now, when an act of terror occurs, people can see it for what it is: someone exploiting religion,” she said. Fowler never really stopped training. She joined the Run to Remember half-marathon last May. Most mornings through the long, cold winter, she left the house before dawn to get to the gym. This year, she is raising money for the Revere Special Education Parent Advisory Council, an organization close to her heart because one of her three children is autistic. “I definitely feel a passion to represent this year, for the victims, for their families, for the city, for my family, and for the communities that I’m part of,” she said. 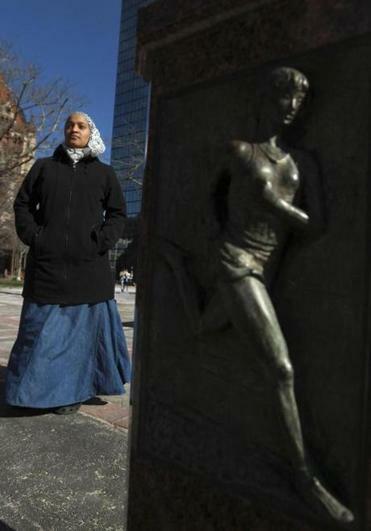 The Boston Marathon was always part of Syed’s life growing up. Every year, his parents would take their seven children to spend Patriots Day with another Pakistani family that lived in Brookline, a block from the marathon route. The youngsters would scramble between the house, where they watched the elite competitors on television, and Beacon Street, where they gave the runners high-fives and cups of water. But Syed, 26, who works at Oracle, never imagined running until last year, when he spent the weekend before the Marathon with two friends who were running. The night before the race, he signed up to run the Chicago marathon with one of them that next fall. After the bombings, Syed knew he would somehow run Boston, too. The attacks felt like an assault on his childhood memories. But what wasn’t taken away after the tragedy was his sense of belonging. It was a hard-won feeling, after years growing up in the shadow of 9/11, and then gaining a new self-confidence as a student at Boston University. Studying abroad in Beirut and then visiting Pakistan made him realize, at last: He is an American. And Boston is home. The day after the bombings, Syed put on a hoodie and went for his first training run along the Charles River. Along the path were messages scrawled in chalk: Live with no fear. Stay Strong. “Not to be corny, but I kind of felt like there was a city behind me,” said Syed, whose run will benefit research for liver cancer, a disease that recently took his uncle’s life. The bombings, he said, “were the actions of two individuals, and sure, they were part of a denomination, but the response to it was just human, pure and simple.